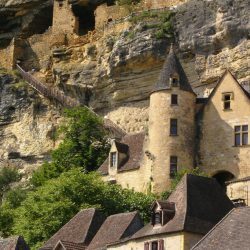 12km from the campsite, discover La Roque Gageac, labeled « The Most Beautiful Villages of France », nestled between the cliffs and the Dordogne and famous for its charming houses with ocher facades. Located in the heart of the Périgord Noir, this charming village is home to sumptuous gilded houses with tiled roofs or lauze. 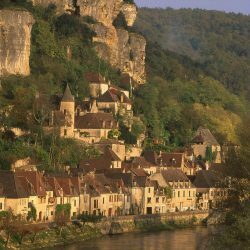 Stroll through the narrow streets leading to the foot of the cliff from which one can enjoy a magnificent view of the Dordogne where, in the 19th century, the famous gabars loaded with merchandise passed. From June to September guided tours of the village are organized by the Tourist Office Sarlat Périgord Noir.